Top 10 Laptop for Engineering Students in India. 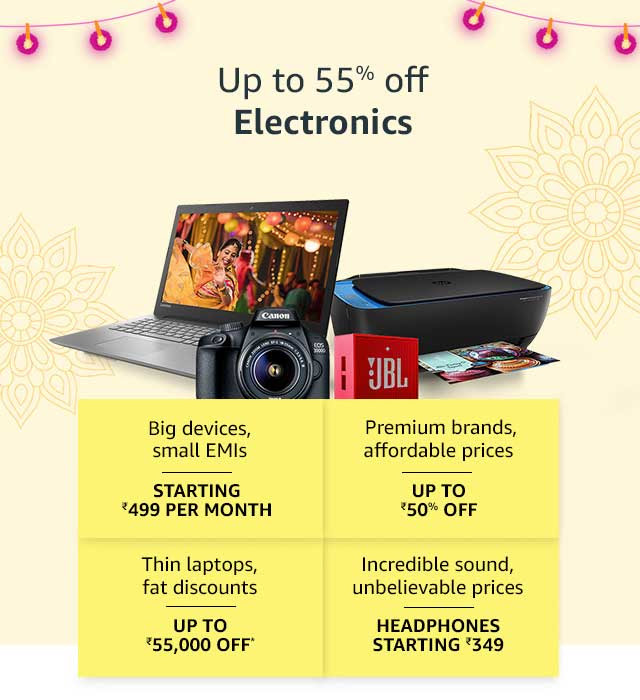 This Diwali offer flipkart and amazon provides you big discount on laptop Flipkart’s “THE BIG BILLION DAYS" Starts From [10th-14th Oct'18] and AMAZONGREAT INDIAN FESTIVAL start from (10- 15 OCT), so this time is best for buy a laptop. Every engineering students post graduate or under graduates wants their laptop must be fast speed, good storage, good processer, good battery life, light weight, good Graphics Card memory and easy to carry anywhere. This article provides you top 10 laptop which have above also cheap in price because many of student’s family background middle class. 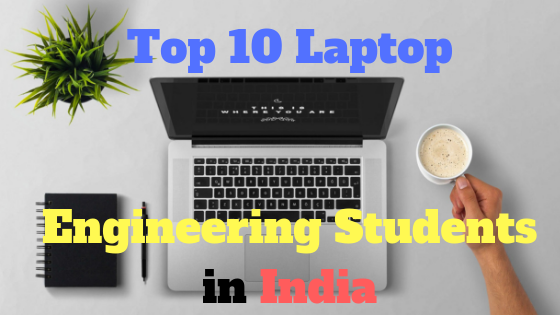 This article provides you top 10 best laptop for engineering students all price categories – top laptop under 20000, 30000, 40000, 50000, 60000, 700000…...1 lakh and more. You can buy laptop your price categories with our given link. A good laptop must have a good battery life because its haven’t good battery its like a tv. every engineer have many big apps in laptop and apps consume more battery so first thing to buy a laptop a good battery. Second thing ram because every engineer install many apps and game his laptop so he want good ram greeter than 4 GB ram. The 2nd things a good laptop must have a good processer many of cheap laptop provider give AMD processer and we all know best processor is Intel Company. I think the perfect size of laptop is 15-inch screen size. Here below I am providing top-5 laptop see and buy online amazon and flipkart. Many of Indian shopping website gives you Diwali Offer and its start 10 oct to 10 number so my friends it’s a good time to buy a laptop. This Diwali shopping portal like flipkart and amazon gives you discount on laptop. Flipkart’s “THE BIG BILLION DAYS" Starts From [10th-14th Oct'18] and AMAZONGREAT INDIAN FESTIVAL start from (10- 15 OCT). AMAZON GREAT INDIAN FESTIVAL starts from (10- 15 OCT) provides you up to 55% Discount on laptop. More savings with 10% Instant Discount on SBI Credit & Debit cards. Asus TUF FX504GE-EN224T (Core i7 8th Gen/8 GB/1 TB/128 GB SSD/window 10 home) is best for your daily needs. The laptop has 15.6-inch Full HD LED display. This laptop is powered by processor 2.2 Ghz with turbo boost to 4.1 Ghz, coupled with 8 GB GB of RAM and has 1 TB HDD and 128 GB SSD storage and 2.3 kg weight. It has NVIDIA Geforce GTX 1050Ti High Graphics Performance 4 GB graphics card is concerned this notebook has graphics card to manage the graphical functions. The laptop has 1 USB 2.0, 2 USB 3.0 port. It’s a best laptop if your budget around 90, 000. 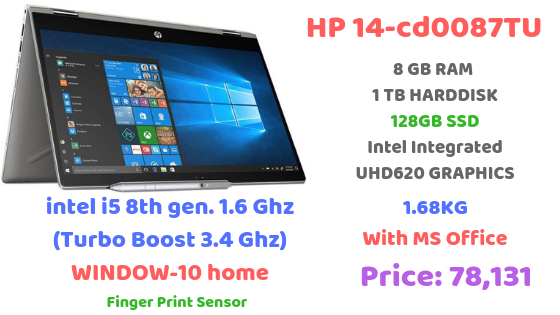 HP Pavilion x360 14-cd0087TU Laptop (Core i5 8th Gen/8 GB/1 TB/128 GB SSD/window 10 home) 2 in one laptop is best for your daily needs. The laptop has 15.6-inch Full HD LED display. This laptop is powered by processor 1.6 Ghz with turbo boost to 3.4 Ghz, coupled with 8 GB GB of RAM and has 1 TB HDD and 128 GB SSD storage and 1.77 kg weight. 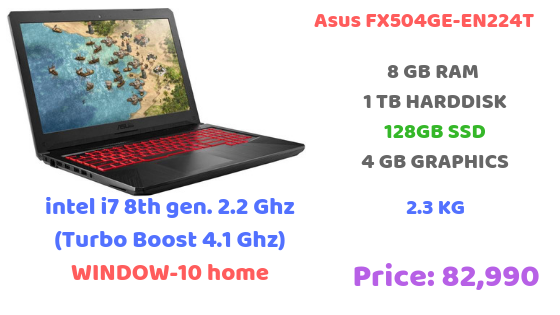 It has Intel Integrated UHD620 for High Graphics Performance graphics card is concerned this notebook has graphics card to manage the graphical functions. The laptop has 1 USB 2.0, 2 USB 3.0 port and one type c port. It’s a best laptop if your budget around 80, 000. 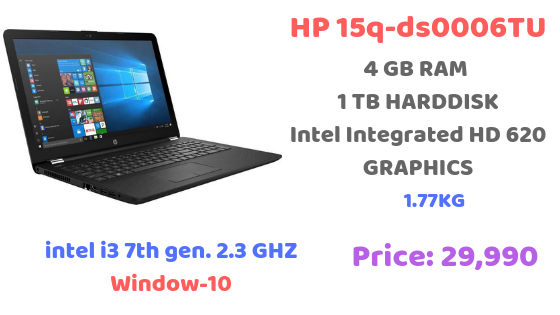 HP 15q-ds0004TXLaptop (Core i5 8th Gen/8 GB/1 TB/window 10 home) laptop is best for your daily needs. The laptop has 15.6-inch Full HD display. This laptop is powered by processor 2.3ghz, coupled with 8 GB GB of RAM and has 1 TB HDD storage and 1.77 kg weight. It has NVIDIA MX110 GeForce for High Graphics Performance 2GB graphics card is concerned this notebook has graphics card to manage the graphical functions. The laptop has 1 USB 2.0 and 2 USB 3.0 port. It’s a best laptop if your budget around 50, 000. 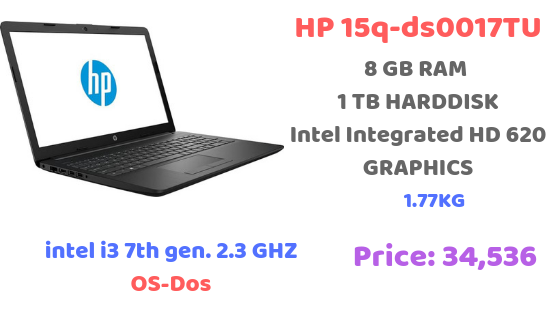 HP 15q-ds0017TU Laptop (Core i3 7th Gen/4 GB/1 TB/DOS) laptop is best for your daily needs. The laptop has 15.6-inch Full HD display. This laptop is powered by processor 2.3ghz, coupled with 4 GB GB of RAM and has 1 TB HDD storage and 1.77 kg weight. It has Intel Integrated HD 620 graphics card is concerned this notebook has graphics card to manage the graphical functions. The laptop has 1 USB 2.0 and 2 USB 3.0 port. It’s a best laptop if your budget around 35, 000. 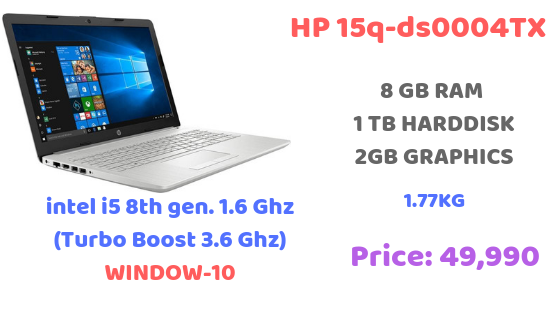 HP 15q-ds0006TU Laptop (Core i3 7th Gen/4 GB/1 TB/Windows 10) laptop is best for your daily needs. The laptop has 15.6-inch Full HD display. This laptop is powered by processor 2.3ghz, coupled with 4 GB GB of RAM and has 1 TB HDD storage and 1.77 kg weight. It has Intel Integrated HD 620 graphics card is concerned this notebook has graphics card to manage the graphical functions. The laptop has 1 USB 2.0 and 2 USB 3.0 port. It’s a best laptop if your budget around 30, 000. Asus X Series X541NA-GO125T Laptop (Intel Quad Core/4 GB/1 TB/Windows 10) laptop is best for your daily needs. The laptop has 15.6-inch Full HD display. This laptop is powered by processor 1.1 ghz with turbo boost upto 2.7 Ghz, coupled with 4 GB of RAM and has 1 TB HDD storage and 2 kg weight. It has Intel Integrated UHD 620 graphics card is concerned this notebook has graphics card to manage the graphical functions. The laptop has 1 USB 2.0 and 2 USB 3.0 port. It’s a best laptop if your budget around 25, 000.